With the coming of the new year, many of us take the time to look back and reflect on the events of the past year. In turn, we may try to find ways to make amends in the new year and improve our lives. It is definitely a time of reflection and self analysis. When Christ left us with the Eucharist, it is a gift that offers us a chance to be one with Him and allow Him to be a part of us. By spending time with the Eucharist in Adoration, we are in some ways taking the opportunity to open our hearts to ourselves and put a mirror on our soul so to speak. There, we pray to Jesus to come closer to our lives and ask Him for guidance on how to improve and become a better person. Please stop by our Adoration Chapel and visit Jesus. He is there waiting for us. Please consider finding time to make a regular obligation to sit with Christ. We have open hours available and have a real need for regular adorers during the overnight hours. Contact Pat Longboat, email plongb49@roadrunner.com or phone 998-0593. A consecrated host, the Body of Jesus Christ, exposed in a Monstrance and available for all Christians to view, pray and worship. This is a chapel available to anyone, 24 hours a day, 7 days a week for adoration and prayer. 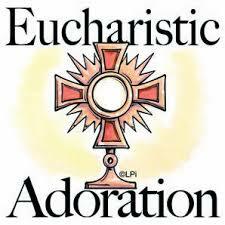 By establishing a perpetual adoration chapel, a parish commits as a whole to pray before the Eucharist. This commitment by the parish strengthens the faith of everyone, not only in the parish, but for all Christians. This then forms a bond for everyone that reminds us that we are all children of God and share together in the joy that Jesus Christ brings into our lives. What happens in Eucharistic Adoration? This time spent is completely up to you. People will spend their time praying the rosary, reading the bible or other literature, or simply sitting in silence and recognizing the blessings before you. Listening to God speak to you and filling your heart and soul with the joys of Jesus’ love. 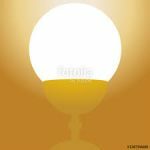 How much time does one spend in Eucharistic Adoration? Typically a person signs up for one hour of time with our Lord. The inspiration comes from Matthew 26:40 when in the Garden of Gethsemane the night before His crucifixion, Jesus asks Peter: “So, could you men not keep watch with me for one hour?” Others find the experience so wonderful that they attend for multiple hours. If I sign up for this ministry, how often would I need to attend? This is really up to you. We have many people that have a regularly scheduled hour or two every week. However, we recognize in this busy world, dedicating this kind of time on a weekly basis may seem a bit overwhelming. So if one hour or two hours a month is all you can do, we welcome you. Many people have formed a group that rotate the same hour each week. For instance you and three friends can sign up to fill the 1:00am hour on Monday mornings. With a parish our size, there are more than enough people to have two people in the Chapel every hour and not have to be there individually more than once per month. Remember, this is our Church family making this commitment to adoration, you are not alone. If I sign up for an hour that is in the overnight hours, am I safe? Yes, the Adoration Chapel here at Nativity is in a secure building which is locked from 8:00 PM to 7:00 AM daily. If you sign up for a time when the building is secure, you will be provided with a code to enter. Does a person have to be a member of Nativity of Our Lord parish to sign up for Adoration? No, our chapel is open to all. We currently have people signed up that are from other parishes. This makes our experience even more beautiful, knowing that more and more people have come together to share our faith and love of God, Jesus and the Holy Spirit. Are there times that the chapel at Nativity is closed? Yes, but very rarely. The Eucharist is not exposed during the Easter Triduum. Sometimes for parts of Christmas and New Years we also close the chapel and there are certain times we may close for cleaning or general repair of the chapel.